Several weeks ago, I was fortunate enough to join U.S. Freeskiing and U.S. Snowboarding in Tijuana, Mexico to build a house for a family in need. Our chaperone, Kate Anderson, who works for USSA, made the same trip several months back. Upon her return, and feeling more grateful than ever, she came up with a proposal to send a group of athletes on the same trip. With the help of generous donations from USSA, we were able to send 20 athletes to Tijuana to help with this project. Hope Sports is an organization lead by Guy East, a professional Cyclist in conjunction with Homes of Hope. Guy explained to us that while on a ride one day he noticed the conditions of the community he was riding through and how the people were living in extreme poverty. He then quit his cycling career to build homes for families in desperate need. More Than Sport helps athletes do more than compete to win. They inspire others to help the communities who society too often overlooks, and they give family’s hope for the future. We started in San Diego then drove 40 minutes south to the most frequently crossed border in the United States. I wasn’t sure what to expect when we got there. We arrived at a Mission base in Rosarita, Mexico. Rosarita is a community of older retired Caucasian couples with gated communities and beach houses. Our accommodations were really nice and this kind of threw me off guard. The morning of our first build day, we had a morning meeting to go over details of our two-day build and to learn about the family we would be building the home for. We found out that the family only made $65 dollars a week, and the four of them lived in a little shack built on dirt. They had stuffed pairs of jeans into the cracks of their “ceiling” to absorb water because all of their belongings were getting soaked when it rained . The four of them shared a foam mattress for a bed that was propped up on milk cartons. They had no running water. When they showered, they had to fill a bucket and stand in the middle of their home to wash themselves. Their cabinets barely had any food in them, and the food that was in there had flies all over it. Their fridge was bare and had leftover food that was going bad. Just think, the leftovers we don’t even take home and the food we throw-out would be a meal for this family. Being able to see this in person was really hard to take in. It put life into perspective to see that people are actually living in conditions like this, and that if you think you’re having a bad day that someone out there has it way worse than you could even imagine. Once we got to the family’s plot of land, there was a concrete foundation already laid and a pile of wood beams and plywood that we would use to build the house. The homes we built were very simple: single story, four walls, three windows, and a door. The family was on site to help build their home. One of the craziest things to me, was that all the neighborhood kids that lived next to the family were there helping in anyway they could, even though it wasn’t their family getting a new house and knowing that their families could use one too. The first day we got all of the walls up along with the roof frames. Everyone was so excited and ready to work that once the bigger jobs were over, we all still wanted to help out! After leaving the site the first day and being hot and sweaty after working all day we got the luxury of going back to our hotel where there was running water for showering and dinner waiting for us. It was hard to swallow that that the family we were helping doesn’t know where their next meal is coming from, and that they just can’t take a quick shower after a hard day of work. The second day was by far the best day, not only because we finished the house, but because we presented the home to the family. The family surprised us all by making us lunch. This was so amazing to me because a family that barely has enough food to feed themselves made an absolutely incredible meal for over 20 of us. They served pasta salad, chicken, potatoes, and tortillas. The meal was so delicious and really opened my eyes to the community in Tijuana. Their neighbors have a little convenient store and they helped the family make us that lunch by providing pots, pans, a stove, and food for the meal. The sense of community the people have there and their desire to help take care of each other is so inspiring. We all chipped in money to donate to the family so that they could go on a shopping spree. I was so fortunate to be able to go with the family to the store. At first they were extremely timid in picking out things they needed. My teammates and I were there to help reinforce that it was OK to get more than just what was needed. With over 5,000 pesos donated we were able to get the family food, mostly non-perishables, cleaning supplies, toiletries, clothing, shoes and even had some leftover money to save. The smiles on their faces when we had four shopping carts filled to the brim was priceless. After we returned from the store the house was ready for the family, but before they could enter the home we got into a circle for a traditional blessing of the house. We each held the keys to this family’s new house and said something about how we wish this new home brings hope into this family’s lives. This is when the water works started to happen. The family then walked into their new home with more surprises on the inside. We were also able to give the family a new bunk bed, table set, and new stove. 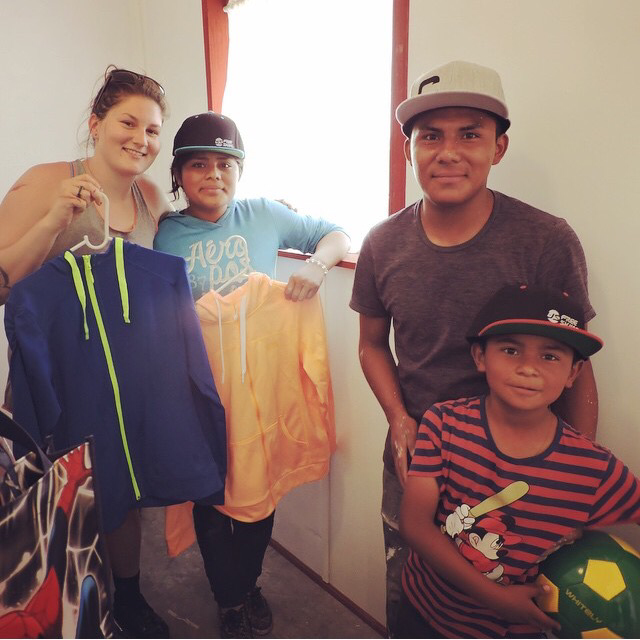 A bunch of us donated some clothing, hats, backpacks and other gear, and we could hear the family’s squeals of happiness and bickering over who got what. The family then expressed to us, with lots of tears of joy and happiness, how grateful they were to have a home and new hope for the future. The best was when the children thanked us for making this dream come true for their mother. It was her dream to be able to give her family a home and now they have it. This trip was such an amazing and eye opening experience for me to be apart of. It makes me so grateful for all the things that I have in my life. Even though I may have gone through my own struggles, it is no comparison to what others in this world are going through. Before this trip I knew that this kind of poverty was real, but I never thought I would be in a place to see it. Being able to see this family and community go through their many challenges and see that they are still smiling and grateful for the simple things, like each other, was an incredible thing to witness. So if you are having a bad day, week, or month, take a second to remember to be grateful for all that you have because there are many people in this world that aren’t as fortunate.